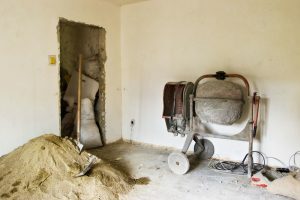 If we asked you what’s one of the most damaging or costly problems you encounter when doing a building or home inspection or working on a building restoration project, we’re willing to bet you’d say it’s related in some way to moisture. Because moisture intrusion/migration often appears in areas that are hidden and not readily apparent during a visual inspection, your ace-in-the-hole for finding hidden dampness is a moisture meter. And speaking of moisture meters . . . you obviously came to this page because of an interest in our new and highly advanced line of moisture meters – meters we at Wagner Meters believe will outperform any meter you’re now using. Yes, that’s a bold statement. But keep reading to learn why we make that claim . 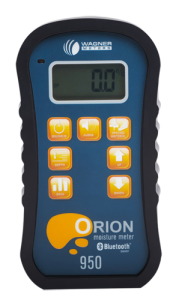 . .
After years in development – and input from professionals like yourself – we are pleased to announce the introduction of our most accurate, technologically advanced, and versatile moisture meters ever: Orion®. Orion meters are loaded with many advanced, user-friendly features to make your job easier and more successful. Let’s look at some you’ll find especially useful . .
Non-damaging. Orion meters are pinless. You never have to poke holes into a property owner’s walls or floors to get a reading as you do with a pin meter. On-site calibration. As electronic devices, all meters can easily fall out of calibration. Temperature, repeated wear-and-tear, and accidentally dropping it can cause your meter to fall short of factory standards. Of course, some meters will tell you when they need calibration. But guess what? You have to send your meter to the manufacturer for recalibration. Inconvenient? Sure. A loss of time and money? You bet. Orion, however, lets you calibrate it. So your meter always stays with you. And always maintains factory standard accuracy for the life of the meter. With our On-Demand Calibrator, calibration is a snap – takes only one minute. 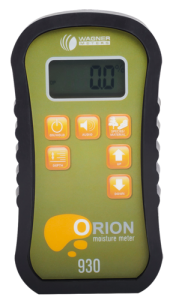 On-site calibration is available only with Orion. Dual-depth readings. One moment you might be measuring thin drywall and later you’re checking a subfloor or thick wood for wet spots. 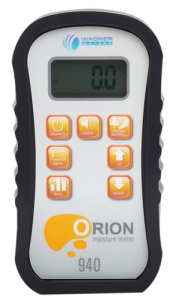 To give you accurate readings, Orion offers you the capability to take both shallow depth and deep depth readings. Shallow depth takes readings ¼-inch deep, while deep depth readings measure moisture up to 1.5-inches deep. IntelliSense™ technology. Humidity, condensation, or other ambient conditions can cause moisture meters to give inaccurate readings. With IntelliSense™, you get an accurate reading IN the wood, not ON the wood. This is especially helpful if there’s surface moisture because IntelliSense™ minimizes its effect on the reading. Data collection. Documenting your findings – especially useful for legal claims or completing customer reports – is made easy with Orion data collection. This features allows you take up to 100 high/low/average moisture content readings for each job. Temperature/humidity sensor. Our top model comes with a temperature and humidity sensor so you can determine ambient interior conditions. Rooms with high humidity might indicate moisture intrusion or suggest the presence of mold. Equilibrium moisture content (EMC). After taking the temperature and humidity, our top model calculates EMC. Suppose you take a reading of a wood floor and then compare it with the EMC. It will tell you if it’s reached equilibrium with the room or how dry or wet it needs to get to reach equilibrium. Press-to-hold. Ever take a reading in a hard-to-reach area? Press the ON/HOLD button once on your Orion and it locks in the reading you took – making it easy to record or show property owners. Programmable alarm. If you come across areas of high moisture content, Orion will sound an audible alarm. Industry-leading 7-year warranty. Property inspection or restoration work can be hard on a moisture meter. Should your Orion meter ever have a problem – no problem! You’re protected up to 7 years. Along with Wagner’s unparalleled customer service, no other brand’s got you covered like Wagner. Orion 930 offers both deep and shallow depth readings. This dual depth capability allows you to scan deep and shallow into wood and other materials. It will also beep an alarm when the scanner picks up a moisture content (MC) higher than specified. This feature makes it especially useful for quickly reading MC in a wall or board. Orion 940 also offers dual-depth readings plus data collection, which analyzes and stores up to 100 high/low/average MC readings. Orion 950, our most advanced model, comes with all the functions of the meters above. It also gives you the ability to capture and record ambient conditions such as temperature and relative humidity and calculate EMC.